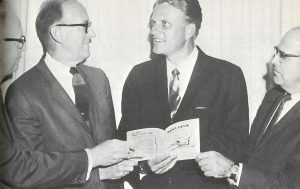 Billy Graham meets with evangelical Methodist leaders in 1967 to discuss the launch of Good News Magazine. Left to right: Frank Stanger, president of Asbury Theological Seminary; Philip Worth, pastor of First United Methodist Church in Collingswood, NJ; Billy Graham; and Charles W. Keysor, founding editor of Good News. Wherever he went around the globe, Billy Graham spent his life preaching a message of God’s love for all people, the essential need to repent, and the assurance that Jesus Christ walks with believers in the brightest and darkest of times. Over his illustrious ministry, Graham preached live to more than 80 million people in more than 185 countries. We observe the news of his passing – at his home in Montreat, North Carolina, at the age of 99 – with both joy and sorrow. He had a great gift and walked with even greater humility. Billy Graham was a role model in holding firm to both evangelism and integrated social action, orthodoxy and generous ecumenism, grace and truth, love and repentance. He was pivotal in helping form numerous evangelical institutions that will be remembered as part of fruitful legacy. Graham served as a great inspiration to evangelical United Methodists. In 1980, he preached at the United Methodist Congress on Evangelism held on the campus of Oral Roberts University in Tulsa, Oklahoma. “Many have moved from a belief in man’s personal responsibility before God to an entirely new concept that assumes all men and women are already saved,” said Graham. “There’s a spreading universalism, which has deadened our urgency that was had by John and Charles Wesley, Francis Asbury, E. Stanley Jones, and others like them. “I have always believed that The United Methodist Church offers tremendous potential as a starting place for a great revival of Biblical Christian faith. Around the world, millions of people do not know Jesus Christ as Savior and Lord, and I believe that The United Methodist Church, with its great size and its honorable evangelistic tradition, can be mightily used by God for reaching these lost millions,” wrote Graham in 1977. Everyone associated with Good News in that era – and subsequent generations – found considerable inspiration in Dr. Graham’s encouraging words. Too bad the Commission on a Way Forward is not there solely for the purpose of addressing what Billy Graham said about the United Methodist Church in 1977. What could be more important than a GREAT REVIVAL, especially with what has transpired in American culture, for example, and the UMC, in particular, since 1977? Once in a while a preacher comes along and makes a big impact. John Wesley was an evangelist. The circuit riders of 19th century Methodism were evangelists. Billy Graham was an evangelist. There are two ways into the faith. One is to be born into a family that takes you to church regularly and to eventually make the decision to follow Christ for yourself at some point. The other is to be raised without the church, but to become a Christ follower after your own exploration and calling. There are some who are raised in the church but reject Christianity, there are some that have no Christian upbringing but accept Christ. The evangelist seeks both the renewal of faith for the experienced christ follower and the acceptance of Christ from the “non-religious” or “non-believer”. It is possible to be a church attending “heathen” according to John Wesley’s sermon “The Almost Christian”. This sermon contrasts greatly with what one may here in a modern UMC. Methodism will grow through birthrate and evangelism. Reproduction and making disciples of all nations are faithful acts and perhaps the greatest acts a Christian can achieve for the kingdom. Well said. I can attest to the non-believer and the almost Christian aspects. It was through others and a Billy Graham Crusade in Boston, MA that I became a Believer. Now I am growing in faith in a Wesleyan way.